Cooking Light introduces The Gluten-Free Cookbook-the search for simple, healthy and delicious gluten-free meals is over. Cooking Light developed more than 180 everyday recipes that will work for the reader searching for a wide variety of satisfying and flavorful gluten-free dishes. Designed in a full-color, easy-to-read format, Cooking Light The Gluten-Free Cookbook is the definitive guide to cooking gluten-free. Questions from individuals who live gluten-free either out of necessity or by choice are answered all in one place. Within the pages of this book, readers will find the best kitchen tips and techniques and helpful information about ingredients that are the basis of gluten-free cooking, including which grains, flours, and convenience products to use. 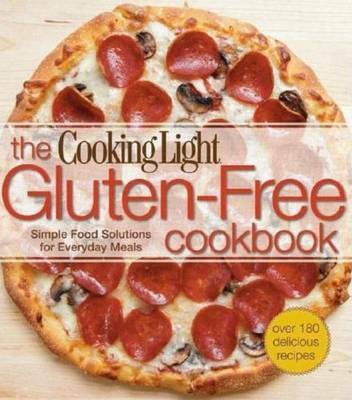 This book offers simple advice on how to avoid gluten-containing products--natural and hidden sources--and teaches what to look for on the nutrition label. Enjoy food previously sacrificed, such as pizza, pastas, meatloaf, sandwiches, breads, and even desserts! On every page, readers will find deliciously transformed, gluten-free versions of their favorite dishes-from quick breads to cakes and oven-fried chicken to spaghetti and meatballs, and more.